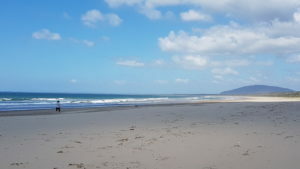 Seven Mile Beach bushwalk offers an extra forest and beach walk. Where: Seven Mile Beach picnic area. The Seven Mile Beach Hike takes you through some stunning forest that sits just off the beach. The track leads down to Seven Mile beach itself which allows you to finish the walk off along this amazing stretch of beach. Option 1 – Seven Mile Beach south loop. 4km loop. The Seven Mile Beach south loop is the shortest option. Start at the picnic area at the end of Beach Rd. This hike takes you through the forest and leads you down to Seven Mile Beach. Strut along the beach for about 2km’s and head back to the picnic area on Beach Rd. Option 2 – Seven Mile Beach North loop. 6km return. If you’d like a slightly longer walk take the Seven Mile Beach north loop. This is similar to the south loop but you just head north. Again you get to bushwalk through some amazing forest and then head back to the picnic area along this spectacular stretch of sand. Option 3 – Combine Seven Mile Beach North and South Loops. 10km loop. Note the entrance from the beach to the trails can be a little hard to spot. So it’s a good idea to download the GPX to help you out. Option 4 – Walking Seven Mile Beach head to Head. 35km return. If your up for a challenge try walking Seven Mile beach head to head. The name of this beach is a little misleading as it’s a lot longer then Seven Mile’s. It’s should have been called 10 mile beach. When I set out to do this I didn’t quite realise how long the stretch of beach was. The return trip is just over 35km. It was a nice enough walk seeing plenty of dolphins surfing along the way. But at the end of it I was really glad it was over. Directions to the Seven Mile Beach North and south bushwalks. Google Map Link. Head to the end of Beach Rd and you’ll see the Seven Mile Beach Picnic area. Seven Mile Beach North loop Trail Map. Seven Mile Beach. North bushwalk. Seven Mile Beach South loop Trail Map. Seven Mile Beach Head to Head Trail Map. Seven Mile Beach walking from head to head 35km. Seven Mile Beach bushwalk Photo Gallery. Seven Mile beach bushwalking Youtube Clip. Google map of Seven Mile beach trail head.